‘Since I was little, this is my favourite place to come.’ Peter Pan. (J.M. Barrie) | Sally says . . . eat, sleep, work, read, play, draw, bark . . .
← ‘All my life, I always wanted to be somebody. Now I see that I should have been more specific.’ Jane Wagner. I can’t remember what Peter Pan’s favourite place was when he was little (the indian camp?—the mermaid lagoon?) but I remember mine was always the movie theatre. Nice one Sal – but who took the photo of the back of your head? Or is that someone else altogether? 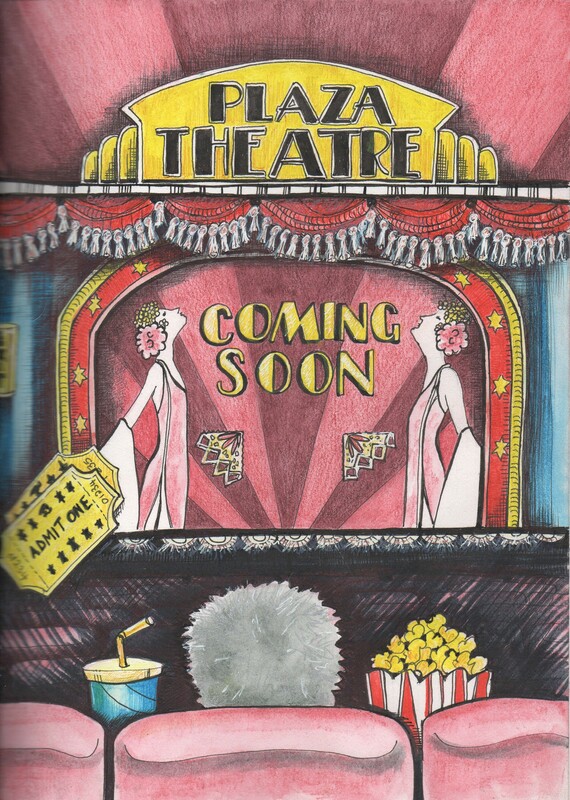 Great sketch Sal & aren’t we lucky to have such a wonderful theatre in our little town! Thank you! It’s such a great little cinema – and full to brimming will of all sorts of fabulous art deco pieces. I just love it.